The Harold I. Pratt residence designed by Delano & Aldrich c. 1919 on Park Avenue at East 68th Street in New York City. 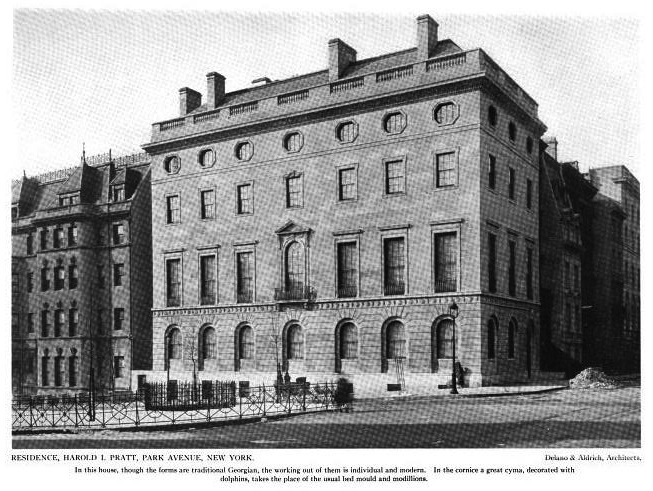 The residence is now home to the Council on Foreign Relations. Click HERE to see the Harold Pratt residence on google street view and HERE to see Pratt's Long Island estate 'Welwyn' in Glen Cove. If Michael Bloomberg were half the man he pretends to be, he'd send one of his drivers out in the middle of the night and girdle that tree. Even with that tree obscuring the Park Ave facade, the house remains simply dignified, elegant and refined. Love the 2 story high main floor rooms. When viewed with the adjacent block the house anchors a very nice row of extant Park Ave townhouses. Tree or no tree, Delano & Aldrich certainly knew how to play the game---when to stretch a proportion, when to go wild, when to hold back. Beautiful building. One of the great New York houses! I am interested to know when and for what purpose the house was expanded. 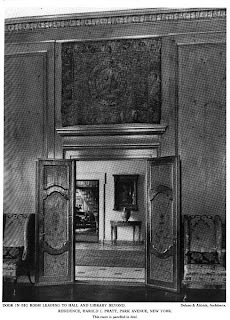 There is another bay to the right of the front door that was not part of the original construction but integrates all the original design elements. Beautiful structure, inside an out. The power of restrained elegance. 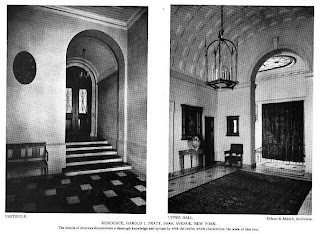 During the years 1919-1920 an elegant town house was erected at the Southwest corner of Park Avenue and 68th Street for Mr. and Mrs. Harold Irving Pratt. Since this was the house which was officially opened as the Council of Foreign Relations’ new headquarters on April 16, 1945, it is interesting to trace the story of the house and its owners. Mr. Pratt’s father had been connected with Pratt’s Astral Oil, and during the latter part of the 19th century, it merged with John D. Rockefeller’s Standard Oil of New Jersey. For the major part of his working life Mr. Harold Irving Pratt, the youngest of Mr. Charles Pratt’s eight children, was the managing director of Charles Pratt and Co. He had been a Council member from 1923 until his death in 1939. In 1944 when the Council was outgrowing its existing space, Mr. Hamilton Fish Armstrong telephoned Mrs. Pratt to see if she would donate her house which was then boarded up as no one was living in it. The next day Mrs. Pratt called to say that she would give the house to the Council. 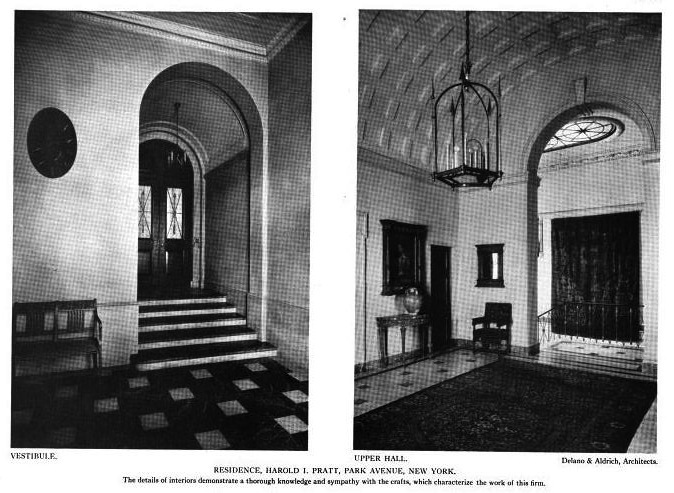 The building was designed by an outstanding architect of the time, William Adams Delano, of the firm of Delano and Aldrich. Only the best materials available were used in constructing the house which is reputed to have cost over one million dollars in 1920. The exterior is of limestone, custom made in the United States and the inside floors are mainly parquet, oak, or a self-polishing marble. As is typical of other houses of the period, a large kitchen and service area were installed in the basement. The Pratt’s dining room was on the main floor where the current Drawing Room now exists. Up the winding staircase on the second floor was a library which also functioned as a dining room and is now used by the Council as the Library. 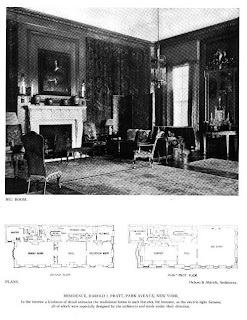 The current Mansion Ballroom was the Pratt’s formal drawing room. At Mrs. Pratt’s insistence it was square, being modeled after a room she had seen in Ireland. It is decorated with pine paneling and beautiful chandeliers each of whose crystals are different. 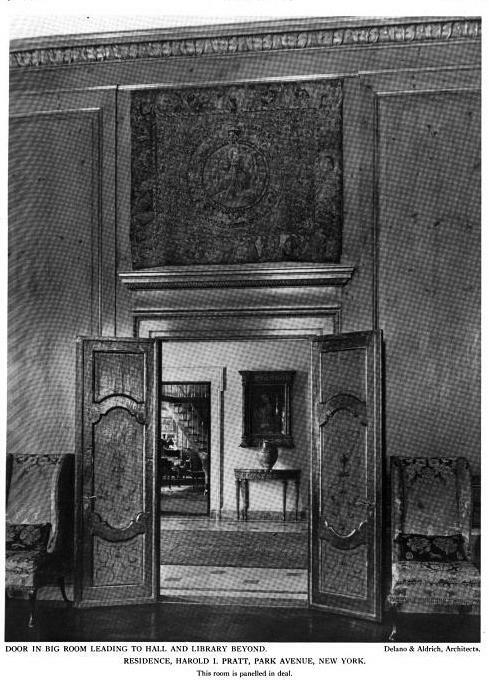 It was also Mrs. Pratt’s wish to use the hand-painted Venetian type doors for the entrance to the library and the drawing room, although the architect demurred that they did not fit with the English architecture. 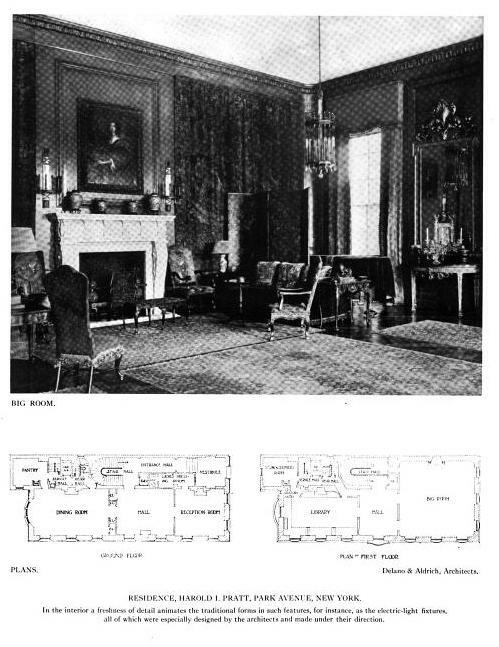 Comfortable bedrooms on the third floor, many with fireplaces, housed Mr. and Mrs. Pratt, their son and two daughters. The fourth floor contained children’s playrooms and sewing rooms and the fifth floor house the majority of the seventeen servants employed to keep the house functioning. 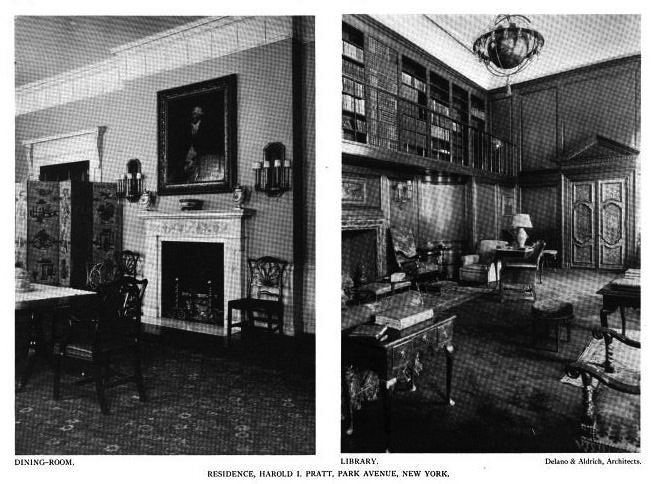 The Pratt family gave three pictures of themselves seated with the original furnishings. These are located in the marble foyer between the meeting rooms and on the south wall of the large meeting room. Did you see the interior floor plan? Everything to the right of the main entrance is an addition to the original house.